Caleb and his brother Bobby Gene are having an average summer, playing in the woods behind their house, when they accidentally trade their baby sister for a bag of illegal fireworks. Shortly after, they meet Styx Malone, a 16 year old boy. He offers to help them get something better for the fireworks, but it requires some trickery: namely, an elevator trade, where they keep trading things for bigger and bigger things. Their father doesn’t like them to leave their small town of Sutton, Indiana, fearing what could happen to them in a place no one knows them, but quickly, their friendship with Styx has them doing riskier and riskier things…like swimming in the lake in the woods, hitching a ride on a train, and “trading,” or stealing depending on who you ask. Caleb has always wanted to have an adventure, and he practically idolizes Styx, who doesn’t seem to be afraid of anything. Styx is mysterious and charming and seems to have learned how to get people to like him, but also won’t get too attached to anyone or any place.It’s how he has learned to survive as a foster child. 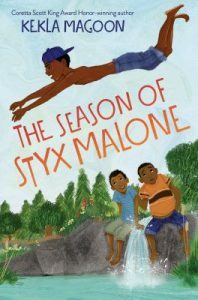 The Season of Styx Malone is an adventure story with laughs and trouble-making, as well as family and friends and the difficulties some people face.